A striking item in any location, the Dali Dining Chair Black is full of style and purpose, boasting a modern classic appearance. Creating a stylish sense of allure in your dining area, the Dali Dining Chair is always a welcome addition to the home. 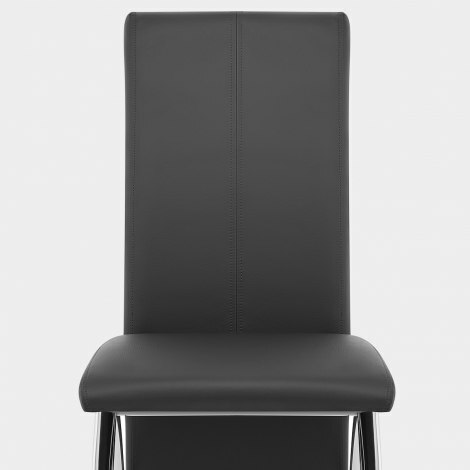 The tall, supportive backrest frames the rear of the seat, extended past the seat cushion almost to the floor. The seat is padded with high density foam for superb levels of comfort, whilst soft black faux leather upholstery above gives an all important luxury touch. The four legs keep the Dali stable and rigid, with an arched design that draws your eyes upwards. Plated in chrome, they contrast with the black seat to great effect, as well as having protective pads beneath that help keep your floors free from scratches. "Strong, sturdy construction. Extremely comfortable"
Good quality, easy to assemble. Fast delivery. Very pleased with my purchase. The chairs arrived well packaged (as similar, more expensive chairs were ordered from another well known company and were terribly packaged, these have since been returned) and they look great and complement our new table, they are sturdy and are relatively easy to assemble. Would certainly recommend as they are good value for money. The chairs were sent directly to my tenants so I haven't had actual sight of them myself, but the tenants are extremely happy with my choice, and the service was second to none. I was kept totally informed along the way and from order to delivery was just one day as promised. Great products from a great company at a great price! Perfect dinning chair with style. The chair is very stylish and comfortable. It's the right size for our kitchen!! Well made and strong. These chair arrived well packed easy to put together and very comfortable would compliment any table. Really pleased with my purchase.